awww..congratulatios !!! and your cake looks great !! Love how you prepared your cake!! Your cake looks beautiful and congratulations on the baby!! I LOVED this cake, it smelled so good while cooking and tasted wonderful :) I paired it with simple lemon curd. YUM! Congrats Anne, thats so very exciting! Love the cake as well and the lemon curd. Great job! Congratulations on the new addition to your family -- that's so exciting! I love the lemon curd and the strawberries together. It's so pretty and I bet it tasted wonderful. Your cake looks sooo tasty! Congrats!! And the cake looks really good. Yum, I love lemon curd. Congrats to you!! The cake looks amazing!! Congratulations Anne!!!!!!! I'm so happy for you! Your cake, no surprise, looks delightful!! :) Hope you continue to feel better! I'm 23 weeks along myself with my first--so trying to enjoy as much baking as I can before the big arrival!! Aw yay - congrats!!! The cake looks delicious, too. Congrats! 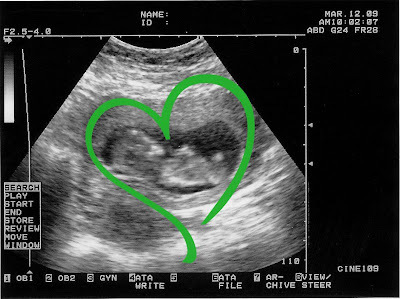 What a cute little ultrasound picture of a perfect looking baby! Strawberry cake sounds and looks so good. I'll have to try lemon curd sometime. Great job. Congratulations Anne -- what an adorable little leprechaun you have there! Glad that you are starting to enjoy food again; I hope that you continue to feel great! Your cake looks perfect too -- hope the baby liked it! Which is more fun this week, that fabulous looking cake with all those berries, or that fabulous looking baby? Baby wins, but the cake was fabulous! Congrats on both. Awww! Yay for the little leprachaun! Cake looks divine. I'll be making that this weekend. That cake looks delicious! I think I might have to try it!. We are so excited for you! Congrats on the new little muffin in the oven! How exciting! Another little Strawberry to love. Thanks for sharing the US. Now, I need to get my hands on that Dora Yogurt. My son Seven loves the crap out of some yogurt, and Dora, and Diego. So sign me up! Congrats! What great news. The cake, lemon curd, strawberries- it all looks so wonderful! Congratulations! And OH MY WORD! Your cake looks amazing! My niece or nephew is also due in September! How exciting! Congrats all around! My b-day (and my husbands) is in September as well - wouldn't that be something if he/she was born on your day! Congratulations!!! Your cake with the strawberries looks so good and delicious. I have Dorie's book and would love to try this the way you made it! I'm definitely going to have to try that cake and the lemon curd! It looks perfect for spring/summer. And congratulations! That is so exciting! Are you guys hoping Will has a little brother or a little sister? 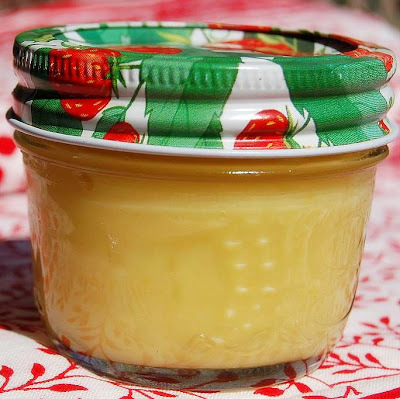 Lemon curd is too yummy to be called "curd"...maybe creme....it reminded me of the filling in Hostess Lemon Fruit Pie...I know that may sound blasphemous on a cooking blog, but I ate many a Hostess Pie from U Totem when I was a kid and loved them! Oh! This is such exciting and wonderful news!! Congratulations, Anne! Best of luck and keep feeling good. We have 2 September babies! Oh...and the cake looks great!! Congratulations! How exciting! Your cake looks lovely with the strawberries. Your cake looks delish! Makes me want to do it again your way! Congratulations, Anne!! Such happy news! Your cake is beautiful! I love how you put sliced strawberries in between the layers. Congratulations! Your cake looks fantastic. Adding layers of lemon curd and strawberries is brilliant. I told you a while back that a little birdie told me a secret about you - glad you shared the photo! And made your own curd - wow. I bought mine of course. I'm just lazy I guess. This cake was fabulous, wasn't it? Lovely cake...and what a wonderful surprise! Congratulations! Congrats on the baby!!!! We love yogurt here!!! This cake looks so good! I can't wait to try it! How exciting for you..baby..awwww! Your cake looks lovely! Congratulations!! You must be sooo happy and excited!! Your cake looks amazing with those strawberries! Wowie!!! A new baker joining in (well, in a few years anyway.) Congrats on that one. Your cake looks almost as good as the 'leprechaun' picture. YAY!!! Congrats! What a wonderful picture, and a yummy cake to go along with it! Congratulations! I feel your pain- we are do in August and I have just started even going near food again! I am so sorry- its the worse isnt it? Congrats on the baby!!! September will be a great month, its my bday too! Love all of the strawberries with the cake! First, your cake looks scrumptious with the lemon curd and strawberries. Second, congratulations on your baby!!! That is so exciting! Is it your first? Congratulations! Your cake also looks wonderful! Your photos are lovely. Everything looks better with strawberries! MMMM, my mouth is watering. Congrats on your upcoming addition! The lemon curd looks awesome and the cake looks delicious. Congrats on your new baby. That is one clear ultra sound! Oh, yeah- love that red cake plate! Congratulations over and over and over again! I am yelling it from my rooftop. Okay, not really, but you get the picture. I am so happy for you all! Your amazing to be baking, posting, and giving away while you are preggers. I just wanted to sleep all the time! Congrats again! Oh yeah, your cake looks wonderful! Glad you loved the cake blah blah blah! It really does look great, but seriously, with the other news, it just pales in comparison! HOOORAY FOR BABY! Huge congratulations! That was definitely my favorite picture of the week too! Your cake looks great and the ultrasound pictures are so great! My daugher loves Dora yogurt. She asks for it everytime we are in the store. CONGRATULATIONS!!!! That is awesome! Oh my gosh that cake looks amazing! I am obsessed with lemon curd and strawberries! 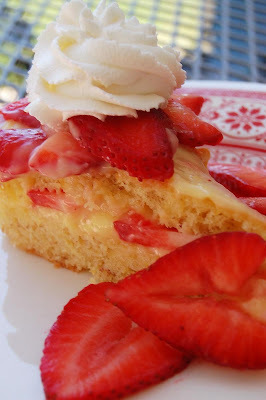 Lemon curd sounds great on the cake - and the strawberries are pretty. Congrats on your little one! Mazel tov! And the cake looks lovely! Congratulations! What wonderful news. Your cake and lemon curd look delicious--I love anything lemon. Congratulations!! This cake looks so good! Yogurt, lemon and strawberry sound like great flavors together. Congratulations! What an exciting time! My kids and I all love the Yoplait Kids yogurt and we'd be really excited to win the prize pack! Thanks! Your blog is so nice and bright! I'd like to enter the giveaway, thanks! Congratulations on your baby! I would love to win the yogurt giveaway - Yoplait is the only kind my son will eat! Great giveaway! My child does love some yogurt. Beautiful baby, thanks for sharing, and for the giveaway. Oh love that little peanut picture. That's pretty sweet, plus when your little one is older you can show him/her their introduction into society of the blogosphere. 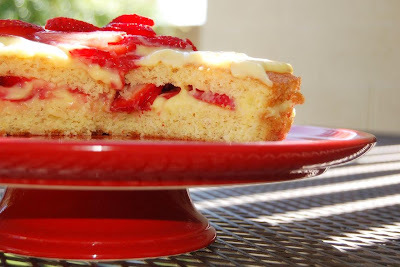 Your strawberry/lemon french yogurt cake is beautiful. It really looks so good. I definitely need to do a redo after spring break so that I can enjoy it more. I'll be back to the blog roll for some pointers. Thanks for stopping by. Congratulations!!!!! Prayers for a healthy baby! Yum! Congrats on the little one. I have 3 boys who LOVE yogurt. They would LOVE to win this! Congrats on the new little one. So exciting! Thanks! The cake Looks great... Congrats on the new addition! My princess would love this! She eats yogurt almost everyday. Thanks! 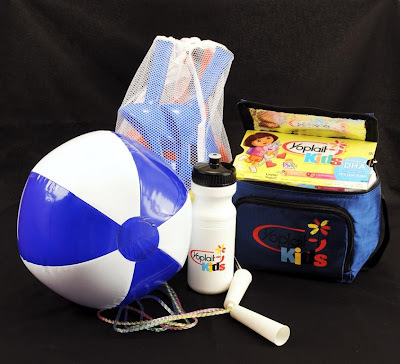 What a fun giveaway for the kids! This would be fun to get in the mail to surprise them. What a joy for you and your husband. Congratulations! Awww, that is so great, congrats! My son has yogurt everyday so this would be great. Thanks!!! Congratulations on your new addition!! By the way your cake looks delicious. I am going to have to try that comination. Congratulations!!! I can understand why you were MIA in the kitchen :) Beautiful looking cake! Your cake is so pretty, very spring-like. I'm sure it was super delicious!